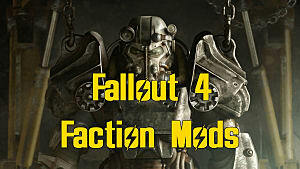 It seems like Bethesda just got started unloading Fallout 4 DLC, yet somehow we've reached the end of the line already, with the expansions slowing to a stop at the post-apocalyptic amusement park Nuka World. 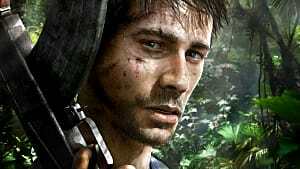 There's a horde of new items, weapons, and even new crafting options to be found while exploring the park, not to mention significantly more achievements than in previous DLCs. 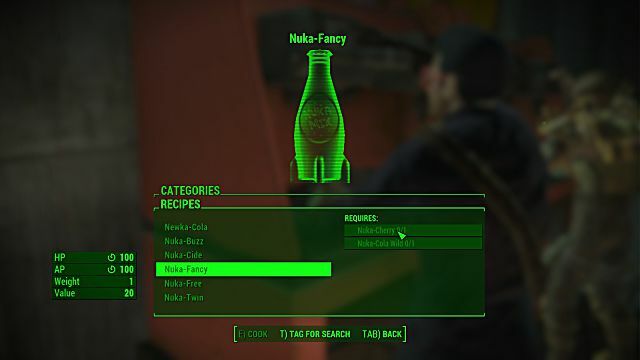 It probably shouldn't come as much of a surprise that an entire amusement park based around Nuka Cola features a ton of different flavors - some old, some very much new. Huzzah, a new crafting option! 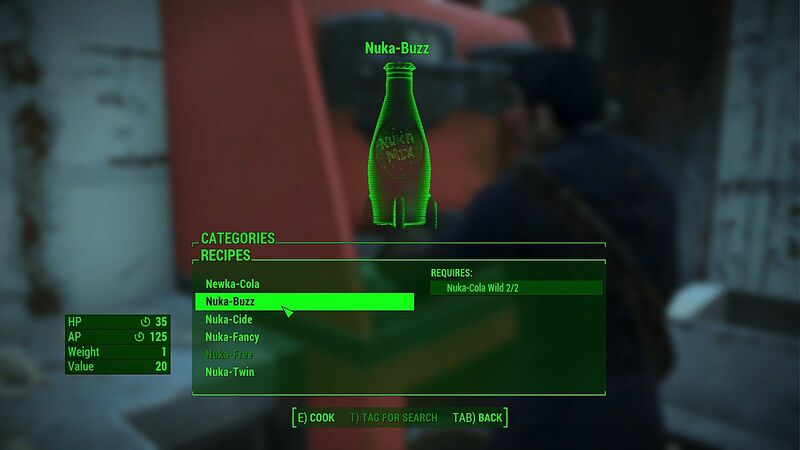 The Nuka Mixer stations let you whiz up your own fizzy wonder drinks bestowing various bonuses and tied to two different achievements. If you don't have any of the required drinks, you can tag each type of Nuka Cola for searching, just like with any other crafting component, so it's not too tough to search down individual types. Obviously you can find quite a few just by opening Nuka Cola machines around the park and looking on desks in the opening area. The one that seems to be most in short supply is Nuka Orange, since you need it for multiple recipes and it isn't found in that many locations. 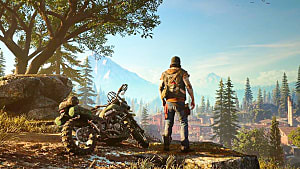 If you can't find what you need while exploring the park, you can buy two at a time from Shelbie Chase in the Market, and she restocks them every 48 hours. If you have a ton of Nuka-Cade tickets, they can also be bought from the prize machine for 1,000 tickets a pop. 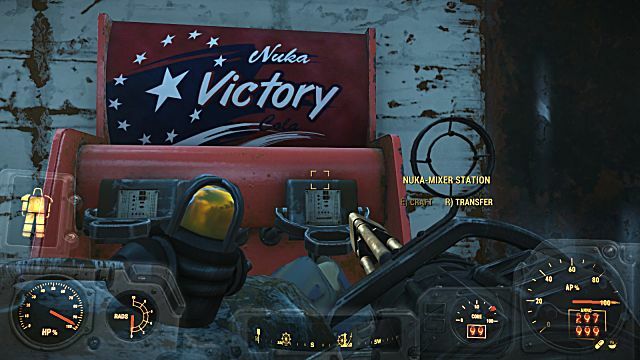 There's one area that seems like it would be a gold mine, but is actually fairly disappointing: the Nuka Cola Bottling Facility located at the World Of Refreshment attraction. 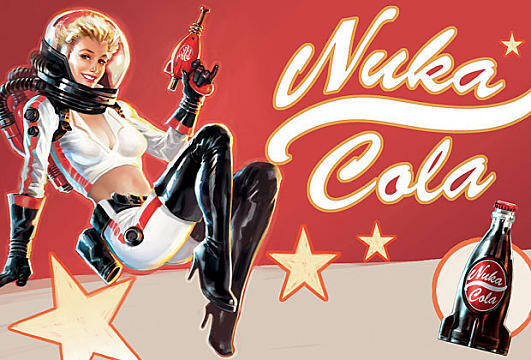 The area is crawling with Nukalurks – that's right, Mirelurks that lived in an entirely Nuka Cola environment! 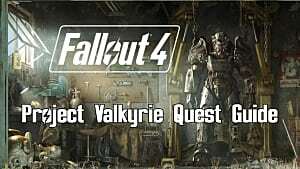 While the facility is stuffed to the gills with Nuka Cola and Nuka Cola Quantum, oddly none of the other varieties are found inside. A Fallout version of that fun "suicide" drink kids like to make by mixing all the fountain flavors together, to make Nuka-Cide you must first grab the recipe book sitting in the back room of Cappy's Cafe. 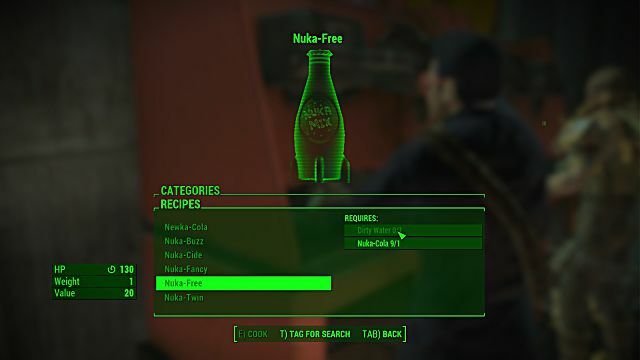 Do you really want a diet, caffeine-free version of Nuka Cola? No, no you do not. 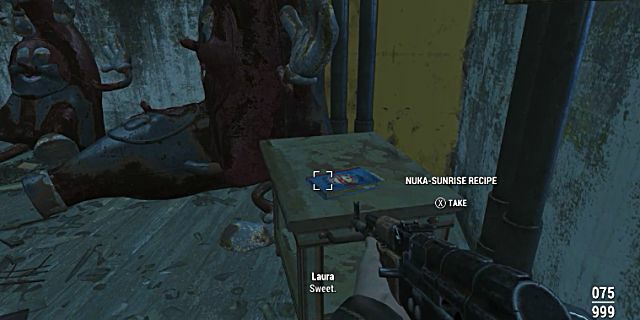 To find this recipe, look for a book sitting on top of the Kiddie Kingdom Fun House control system (found after completing the full Fun House area). 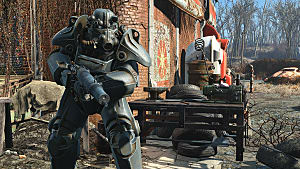 Head into the "Nuka Market" area just to the right of Star Patrol. This recipe is on the left hand side on a yellow shelf. 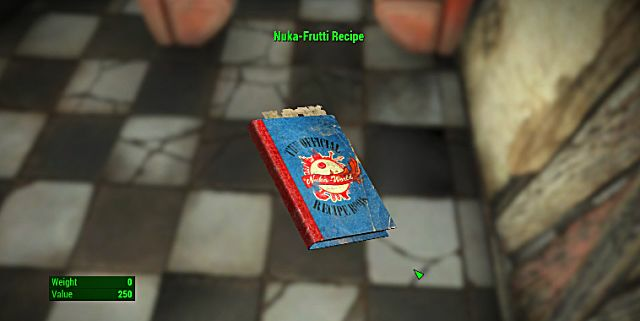 You can grab this recipe book off the black and white checkered floor inside the Huboligist's Camp. 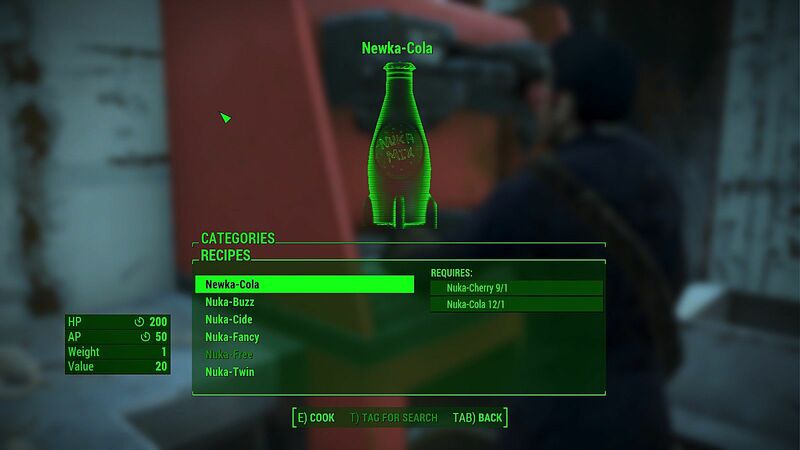 You can get the curiously named Nuka Love recipe from Evan, who is found in (where else?) 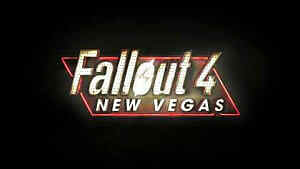 Evan's House at the far south end of the Nuka World DLC map. 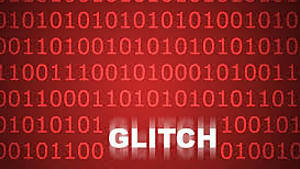 Inside the Grandchester Mystery Musuem (located in the southwest corner of the map), head up to the second floor and travel through the hallway filled with bookcases until you reach a side room. This recipe is sitting on a nightstand next to a lamp. This recipe book is located in the King Cola backstage theater area of Kiddie Kingdom. 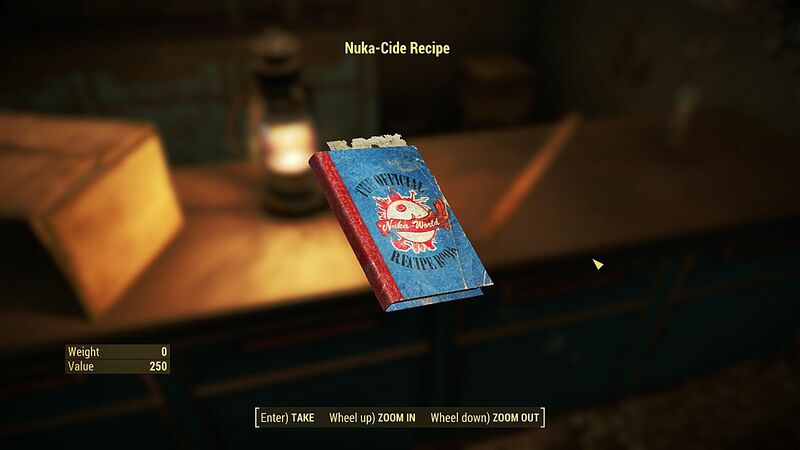 Head into the theater section of Dry Rock Gulch to find this recipe in the locked employees-only area. Also in Dry Rock Gulch, this recipe is sitting on a food cart outside the Mine Cart Coaster. 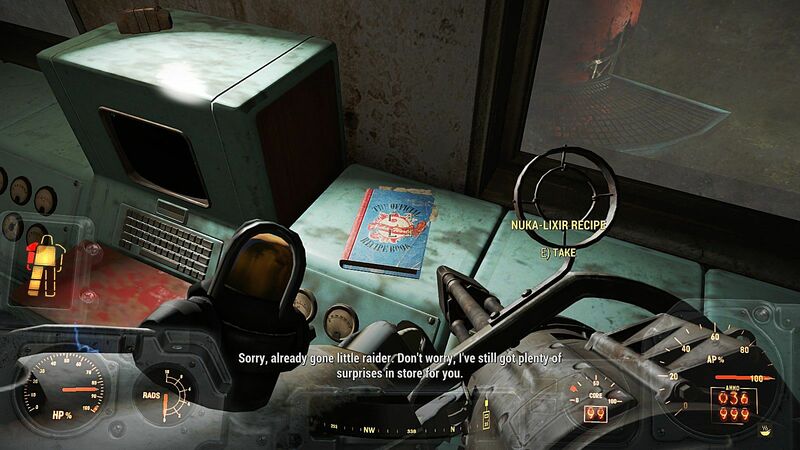 This recipe book is located in the robot-infested Galactic Zone inside the Starlight Theater. It's on the counter next to where the robot bartender is originally standing. 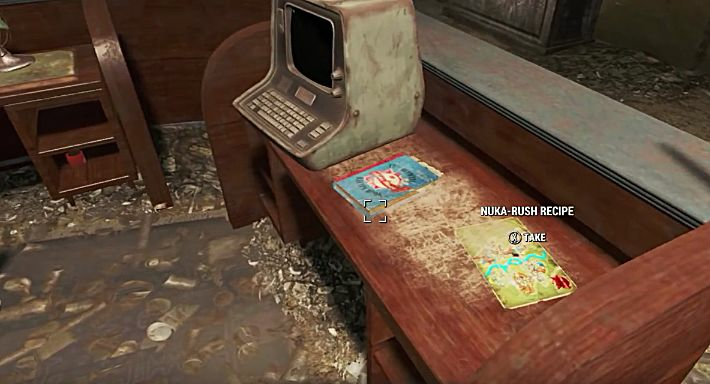 Inside the Power Plant (on the far west side of the map), this recipe is in the room with the pool table and the terminal on a desk. In the Safari Adventure attraction, head inside the Welcome Center building. The recipe is next to a terminal on a desk in the lower level. In the Safari Adventure attraction, head to the right side of the Jungle Journey Theater and head through the broken "Employees Only" fence. Hang a left at the end of the path to find a shed. The recipe is inside on a shelf. In Dry Rock Gulch, head into the theater and turn right to go up into the stands. 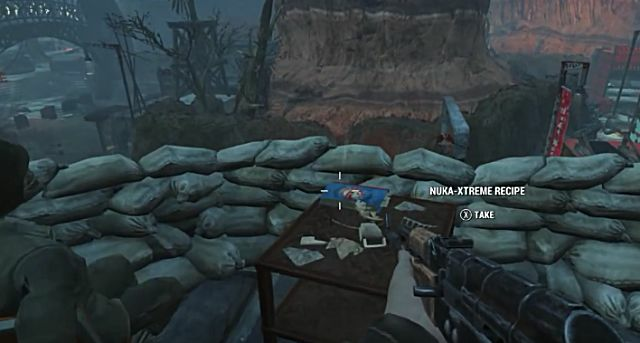 Head up the ladder to find this recipe sitting on a metal table by some sand bags. 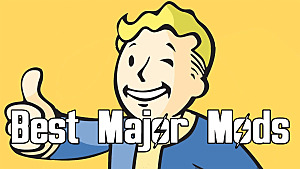 When you create a full 20 different mixes, the Beverageer achievement will unlock. 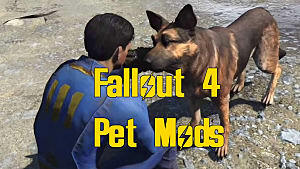 Now down any of the mixes and start killing to unlock the All Sugared Up achievement when you hit 40 kills. 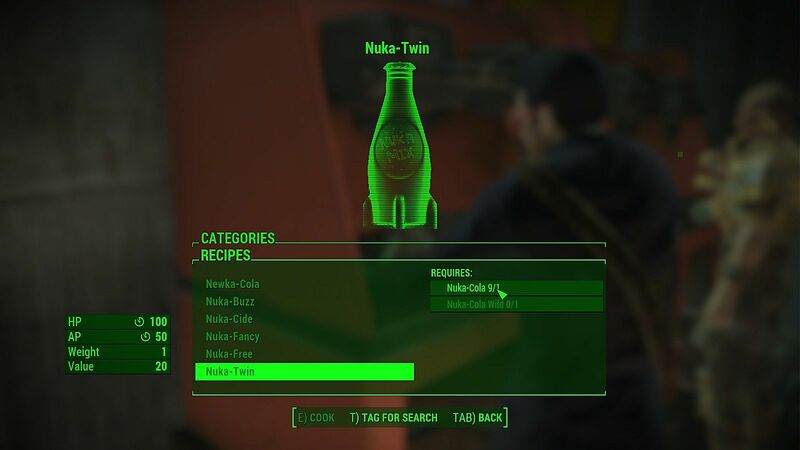 We're still tracking down all the different flavors - let us know if you've found any other recipes while exploring the Nuka World amusement park!